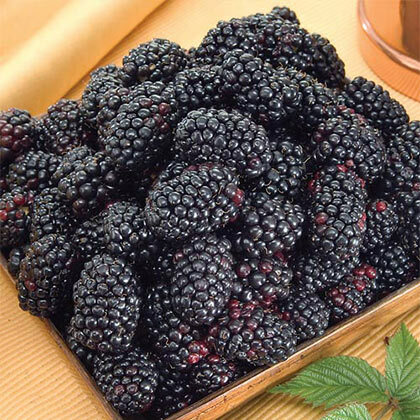 Black Magic Blackberry | Gurney's Seed & Nursery Co. 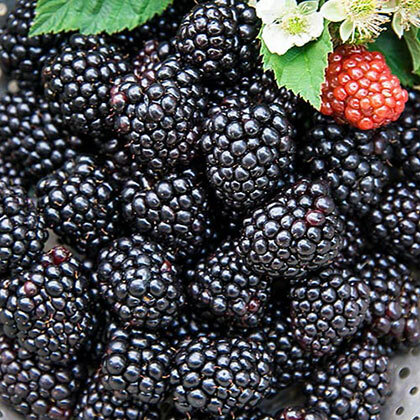 Enjoy big, richly flavored berries not once, but multiple times a season! This double-cropping variety will set a large summer crop and a later fall crop, and may even produce fruit throughout the entire summer depending on conditions! Upright, self supporting and lightly thorny canes are easy to maintain and have impressive heat tolerance we've seen them breeze through 100+ degree days, still pumping out the fruit. Huge yields of fruit, delectable flavor and ease of care are sure to make Black Magic a favorite!. Zones 5-9. PP24249. Flower FormWhite single blooms, first flush in May, with blooms intermittently throughout the Summer, and then again in August/September. BloomsFirst flush in May, with blooms intermittently throughout the Summer, and then again in August/September. FruitGlossy deep wine to black, large fruit, most well over quarter size in diameter. 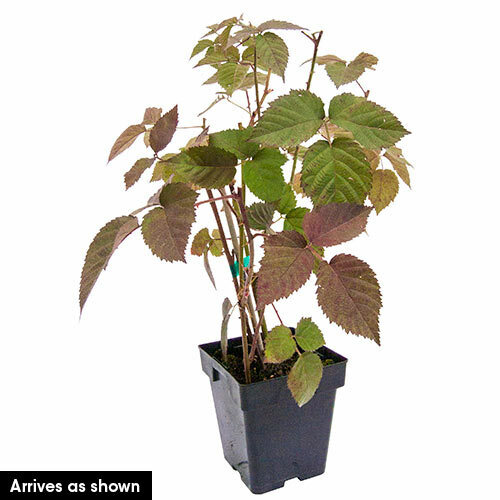 PruningHow you should prune erect and trailing blackberries varies slightly. All cultivars require very little pruning or training during the planting year. Differences in pruning and training between erect and trailing blackberries: Top the primo canes of erect cultivars during the Summer. Don't top trailing cultivars during the growing season. Shorten the laterals of erect cultivars. CommentsDouble cropper, excellent heat tolerance, blooming & setting fruit in Arkansas in August at 101 degree F temperatures, still good setting- compared to all of the other varieties that have shut-down at this point in the heat (if they set flowers, the blooms burn up), doesn't have the post harvest quality that commercial industry needs (only because some of the berries may turn red in storage), shorter self-supporting plants, good quarter plus sized, chunky fruit, firm, nice flavor- rich, complex, sweet-tart, perfect balance of sugars & acids. Slightly thorny plants. YieldApproximately 4 - 6 quarts at maturity. DepthPlant at same depth as in the nursery. Plant so the roots are below soil level.